Kasper Schmeichel should have beaten Thibaut Courtois to the title of world number one goalkeeper, believes Claude Puel. Schmeichel was shortlisted alongside Courtois and Hugo Lloris at FIFA's The Best awards, to decide the top goalkeeper in world football. Real Madrid stopper Courtois took the accolade, but Puel feels Premier League winner Schmeichel should have walked away with the honour. "Schmeichel I think perhaps deserved to finish the best goalkeeper from the world, he had a good season," said Puel. When asked for clarification on his comments and whether he believed Schmeichel was the best goalkeeper in world football, Puel replied: "He can, he can." The Frenchman also confirmed winger Demarai Gray is not set for a lengthy spell on the sidelines, but is instead facing around six weeks out. 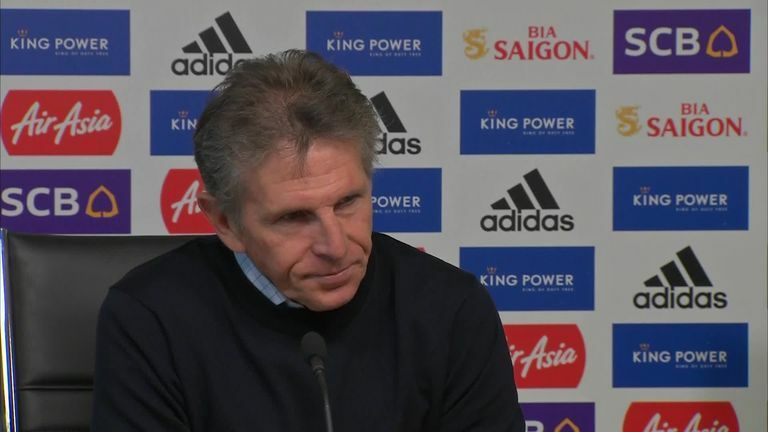 "He is better but will remain within three weeks to six weeks out of the squad, we will see if he can recover quicker... it is not a serious injury but he will need rest and rehabilitation," said Puel of Gray, who left the recent game against Wolves on a stretcher. A scan on Wednesday identified a sprain of the 22-year-old's ankle, as opposed a break which was initially feared. Leicester travel to Newcastle on Saturday, as they look to get 12 points on the table after seven games played. The futures of Andy King and Danny Simpson still remain up in the air, after Puel opted to give neither player minutes in the midweek Carabao Cup fixture. Claude Puel would not be drawn when asked whether Andy King and Danny Simpson have futures at Leicester City. "I have discussed with them the difficulties they can have to find game time with us. We have a lot of competition for places, of course we cannot give all the game time we would want for some players." Puel also suggested £19million summer signing Soyuncu is ready to play for the club, but the youngster will find things easier once his English improves.